If you are looking remote pc access software or remote desktop sharing software ? Then conside TeamViewer remote pc access software. TeamViewer is a friendly solution for remote computer access over the Internet. TeamViewer establishes connections to any PC or server all around the world within just a few seconds. You can remote control your your PC (or your partners) as if you were sitting right in front of it. Download “TeamViewer (full version)“, this can establish connections as well as wait for incoming connects. To connect to a remote desktop( partner 2) you need to have client id and password, which need to supplied to you by your partner 2 (see below). 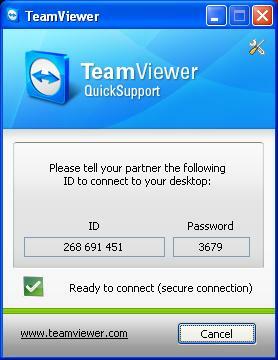 Download “TeamViewer QuickSupport“, which runs immediately without installation and does not require administrative rights. After downloading click the application which will give you a client id and password (see below pic). Just pass this information to to your friend( partner 1), that’s it, he can connect to your computer.